Summary from Goodreads: Sixteen-year-old Kyra, a highly-skilled potions master, is the only one who knows her kingdom is on the verge of destruction—which means she’s the only one who can save it. Faced with no other choice, Kyra decides to do what she does best: poison the kingdom’s future ruler, who also happens to be her former best friend. 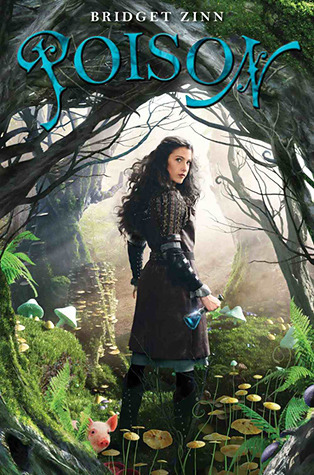 Poison is a delightfully cute and light fantasy novel. The book is published by Disney Hyperion, which makes complete sense because it fits right into their wheelhouse - I could easily see this as a Disney movie! The book was the perfect diversion from some of the darker fantasy and dystopian novels that I read and I loved it! The story centers around Kyra, a young potions master who is on the run after attempting to murder her best friend, the princess (I won't spoil why, but she did have good reason). Kyra believes that she has to finish what she started, so she enlists the help of a cute little tracking pig to help her find the princess (who has been hidden away since the assassination attempt) while simultaneously avoiding the guards (along with her ex-fiance). Along the way, she meets up with Fred, a sweet and charming guy who complicates her life, but who she can't help but fall for! Not much. As I said this is a light, fun novel. So, if you're looking for something dark, serious or with more mature themes, this is not the book for you. Some people might see this as a negative, but I like to switch things up a bit and read a fun novel every once in awhile. That's just what this book was - fun! The humor. I really enjoyed the fun banter between Kyra and Fred. It often had me laughing out loud! In general, I just loved Kyra's wry sense of humor and her reactions to the crazy situations that she finds herself in (crossing the lake in frilly underwear with a pig on her head - totally normal, right?). I smiled through the whole book! The twists and turns. There were quite a few twists in the story, which made it fun to read. There were clues planted for each of the twists, but I definitely didn't have them all figured out (I hate it when I can see all the twists coming from a mile away). While this was the type of book that you figured would end "happily ever after," it was still really fun getting there! A romance that didn't overpower the story. While the romance was definitely a key ingredient in the book, it didn't take center stage and out-shine the rest of the story. Instead, it was just one element in a book that had a lot of interesting plot elements going for it. Yay! I would highly recommend this book to anyone looking for a fun, adventurous fantasy story. It would be especially perfect for younger YA readers (but certainly not only for them!). 4.5/5 Stars. One side-note: I was surprised and saddened to see that the author of this book actually died two years ago of cancer and never got to witness her book being published (at least not here on earth!). She was a talented writer who would have had an amazing career ahead of her. I'm so glad that her husband pursued her dreams for her and kept her legacy alive! Sounds so good. I love to read a light book here and there. This sounds like a really good one. I'm very sad to learn that she died before this was published but it so beautiful of her husband to share it with the world! This is cute and interesting! :) I mean, it reminds me of a Disney princess for some reason, but a really independent and clever one. I'm happy that this appeals to a younger audience, because I totally belong there, though I'm saddened all the same that the author never got to see her work published :( At least her readers get to appreciate her work. That cover is beautiful too!